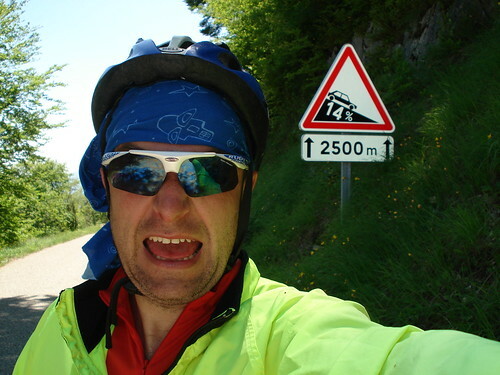 Probably the most famous climb in the Juras. There are four very steep ways up this monster. 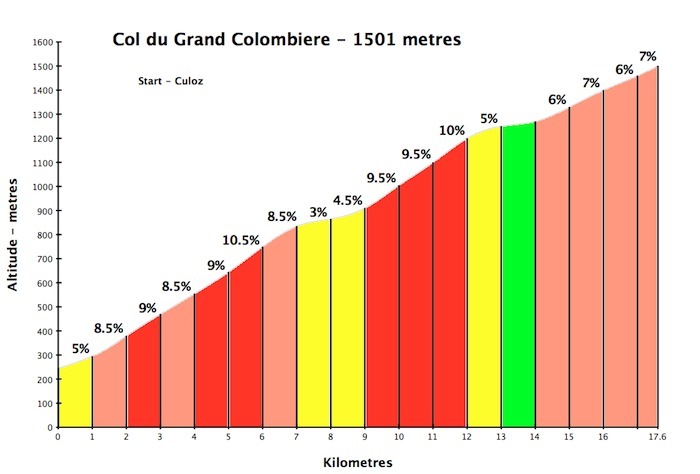 To become a Confrérie des Fêlés du Grand Colombier (translated: Brotherhood of Loons (freaks, crackpots) of Grand Colombier) one needs to climb all four in one day. YIKES …. I am a decade past being able to do that as each climb is a challenge in its own right. One route has parts with a grade of 22%! Trust me 11% is very hard, 22% near impossible. Cyclists are sternly told not to descend by this route. It’s just too steep. Although just climbing 2 sides grants member status, so maybe I should try that. My route was from Culoz, one of the "easier" ways up. It averages 6.9% for almost 19 kms but this is very misleading as there are two short downhills and several easiesh parts. And thus there are two parts that reach 14%. My god! (I was descending when I took this photo so at least the pain was over). Here’s another blog post climbing the hardest route up starting in Artemare. 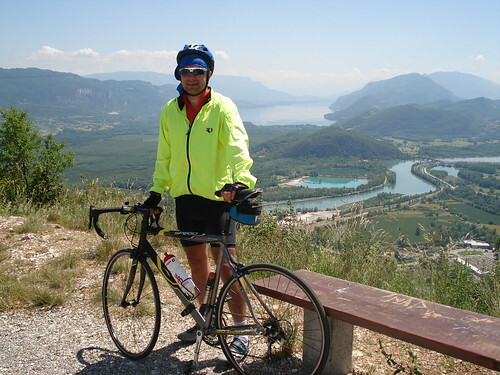 From the very beginning of the route the views are amazing as the steep first 6 kms climb high above the Rhone river and Lake Bourget to the South. I could easily pick out Mont Revard and Mont Chat (2 great climbs) to the South. At about 5 or 6 km mark the first and longest steep part starts with a bunch of crazy short hairpins as the road goes UP. I am an awful descender and this stretch was painful on the way up and a bit scary on the way down, but it is a fantastic! There are a couple of eaier kms then the road joins the route that starts in Seysell and there are three steep kilometres including another short but crazy stretch. As I happily finished this part something bizarre happened. An old man (70?) came running and yelling at me to stop and help him. I stopped and noticed a lot of blood on his shirt and pants. He had been chopping wood and had badly cut a finger (but it was still attached). He had some heavy tape and I helped him wrap the finger and stop the bleeding. It was a bit nerve wracking when he reached for the axe and offered to cut the tape. He was overly greatful and looked a little shaky but refused offers to drive him to a hospital — and he seemd pretty cheerful all things considered. He wished me "bon courage" and I continued to the top. Again, while the last few kilometres are easier than the beginning of the route, there are still a few +10% patches incluing the last few hundred metres. I caught a guy near the top who was on his 3rd climb of the day but was absolutely going nowhere and he was worried he would have to give up his attempt to join the brotherhood of fruitcakes. All I could do was a congratulate him and wish him the best. But I think he was going to quit. Up top the views were actually mediocre as it was a bit hazy. I peeked over the other side, but had no more legs or drinks to dare descend in the wrong direction. 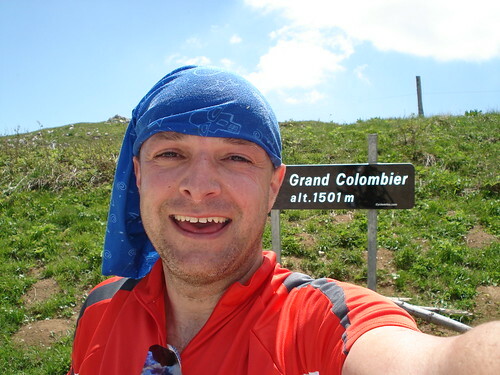 Great ride – and I’ll have to return to have a peek at the other 3 routes. Returned home in time to see the Dauphiné race up Ventoux – amazing. Chilly, what a ride! You are super strong but we have to get you a better fitting helmet. Love, D.
This is one of the best climbs in the Rhone Alps, and must rival many of the Tour classics. I’ve done the Culoz ascent you did, and the ludicrously steep climb through Virieu-le-petit, with it’s insane 22% gradients. Both are supremely challenging rides which I thoroughly recommend to anyone who wants a relatively extreme climbing experience.